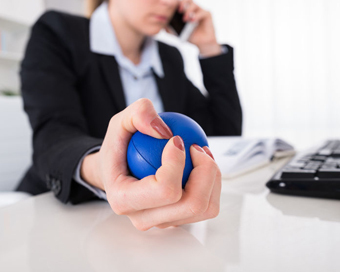 Level of Job Stress in Ireland Doubles! A new ESRI study, funded by the Health and Safety Authority (HSA), finds that job stress among employees in Ireland doubled from 8 per cent in 2010 to 17 per cent in 2015. However, the level of job stress in Ireland was still below the average for ten Western European countries in 2015 (19 per cent). The report uses two waves of a European-wide dataset, the European Working Conditions Survey, carried out in 2010 and 2015, to examine the working conditions that are associated with job stress. Time pressure (e.g. never have enough time to get the job done, work to tight deadlines): those with the highest levels of time pressure were ten times more likely to experience job stress than those under the least time pressure. Employees in the Health sector (18 per cent), Public Administration (16 per cent) and the Manufacturing sector (15 per cent) experience the highest levels of job stress. The occupational groups most likely to experience job stress are technical/associate professionals (20 per cent), professionals (16 per cent) and managers (14 per cent). “Job stress is becoming a more important issue in the Irish workplace as the economy becomes increasingly service based. Employers need to manage these risks to prevent the significant individual and organisational costs of stress-related illness”, said Dr Helen Russell, an author of the report.